OM! Prostrations to the mother of the universe. OM! Prostrations to the one who bears the universe. OM! Prostrations to the extensive one. OM! Prostrations to the one containing all the wealth. OM! Prostrations to the one worshiped by Bhrgu and other sages. OM! Prostrations to the one who can be attained by Knowledge. Om! Prostrations to the blissful one. 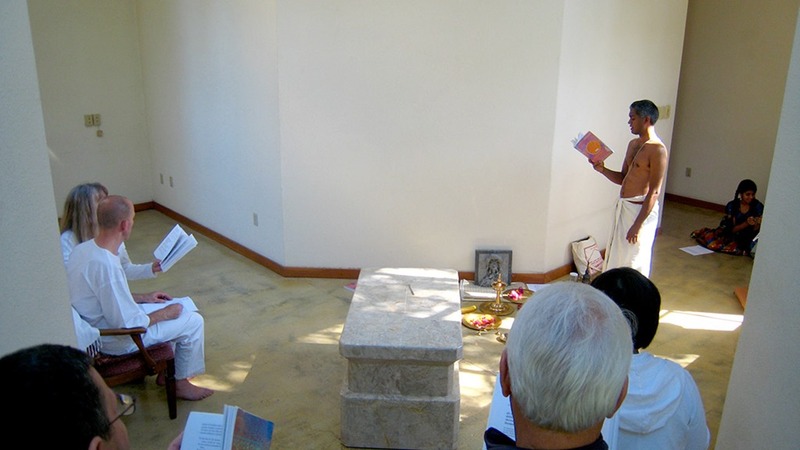 Sunday, October 20, 2013 was an auspicious day for the SAT Temple. After obtaining the necessary building permits from the city of Santa Cruz giving us permission to build our Mandiram (the second phase of the holy project), the truly significant permission for this endeavor was sought from Siva and Mother Earth in the form of a puja, which was preceded by a puja to Ganapati in the area where the Mandiram is to be built to acquire the necessary blessings. 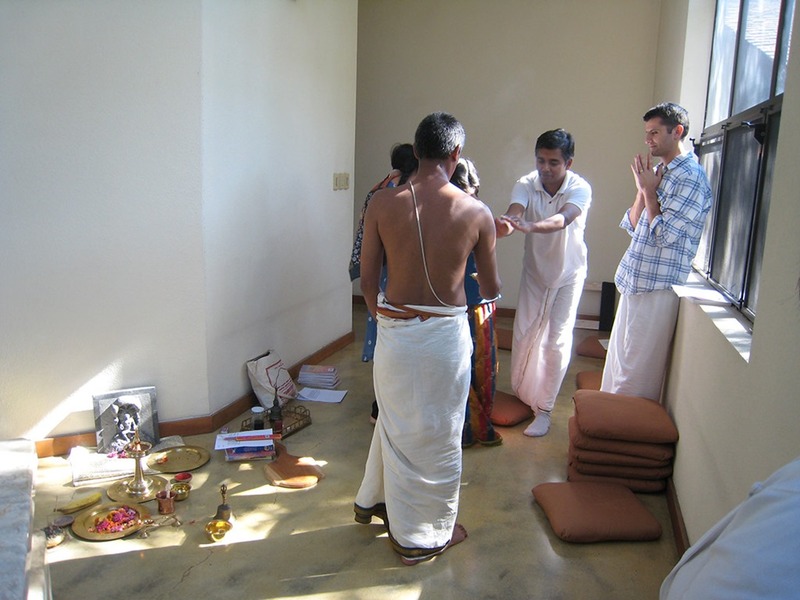 Devotees gathered in the front entry of the temple reciting from Advaita Devatam. 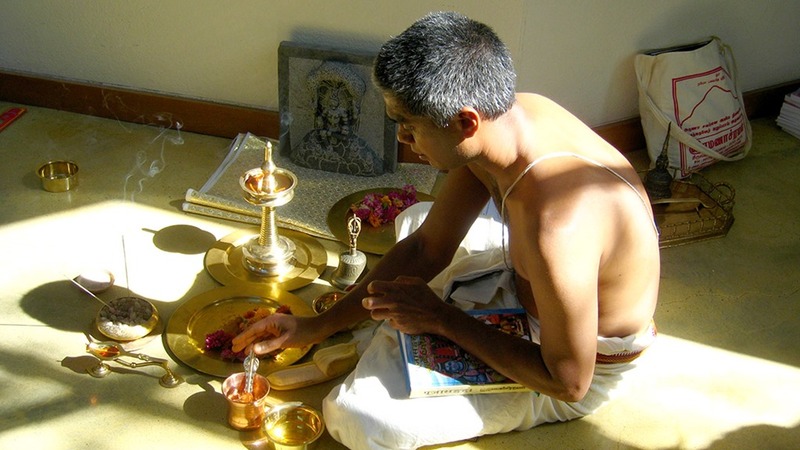 After reciting Dakshinamurti Dhyanam and Siva-Pancaksara Stotram the puja began. While devotees meditated and observed, Ganesh recited Tatittariya Samhita as well as reciting a stotram in praise of Goddess Mother Earth. It is upon Mother Earth the temple resides, and the pillars to support the Mandiram will be placed deep into the bedrock under the temple floor. 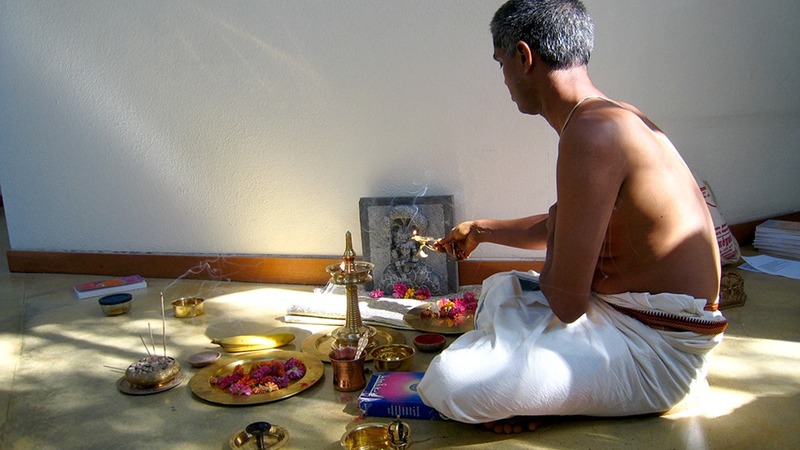 Offerings are made while Dakshinamurti looks on. The Dakshinamurti stone tile in the background will become part of the Mandiram. 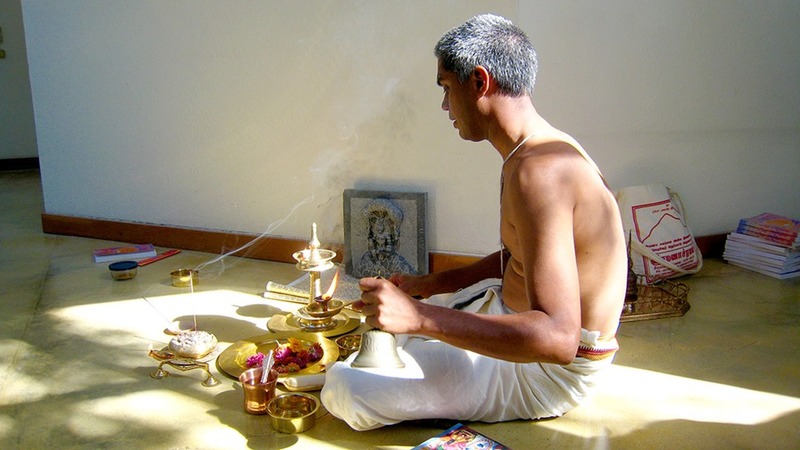 It is customary to include in a puja, prior to construction in a temple, a item or items that will be used in the creation of the structure. 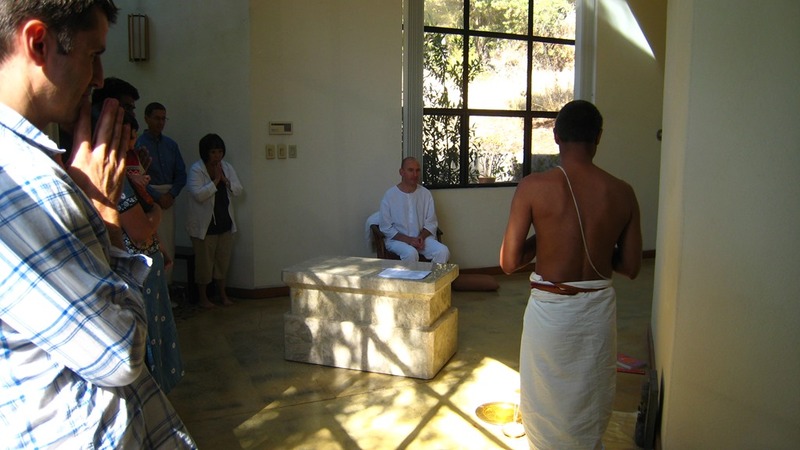 Camphor is offered to all devotees present. Everything is right now for construction to begin. Construction began on Tuesday, October 22, 2013. A post will appear here for the second phase of this project once it is complete. The ancients by no means employed an abridged use of their minds, depriving them of a cosmic view when designing the Hindu Temple. On the contrary, their expanded consciousness set into motion a method of mirroring the inner with the outer and the outer with the inner in relation to the creation of the Hindu Temple. The temple, from the mind’s conception to its physical completion, was created to mirror the inner Consciousness of man. 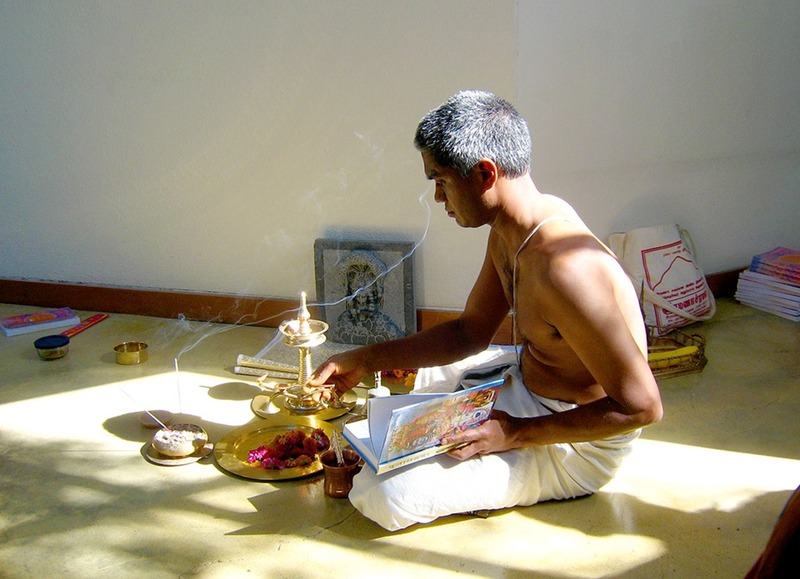 The original creators of the Hindu Temple possessed Knowledge, so the manifestation of the temple was identical to their state and every detail, right down to the very dirt upon which the temple would reside was of utmost significance. The prescribed design of building a Hindu Temple is meticulous, even the smallest detail is not overlooked. 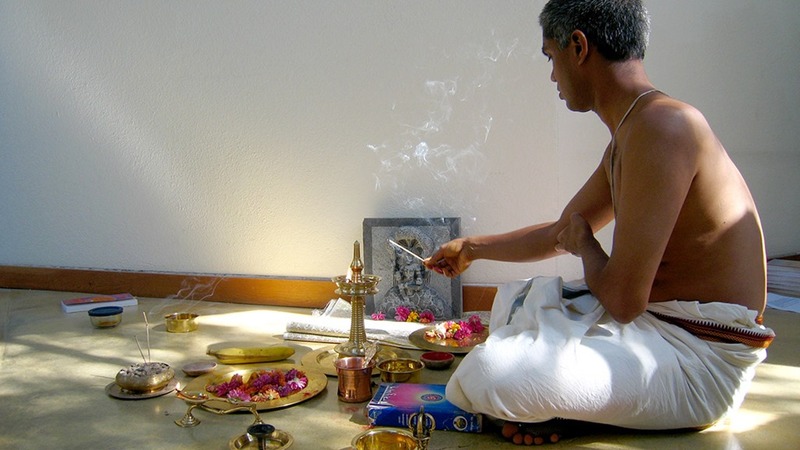 Since everything we do at SAT has the purpose of evoking the experience of the Self, I wanted to know the purpose of Bhumi puja, which was recently performed at SAT to consecrate the beginning construction of the Sadisvara Mandiram. Ganesh Sadasivan and I went to work researching to find information about this puja, which is performed prior to building a temple. A two volume set called, "The Hindu Temple," by Stella Kramrisch (1976), made itself known. These books contain, in copious detail, not only the methodology, but most important, the state of Consciousness from which the creation of the temple begins. What was most absorbing about reading these books was the impression it left. I felt as if I were reading about an inner experience or journey as much as I was reading about the construction of a temple. Below are a few excerpts from the books. They are a minute sampling, however, written in cosmic form, and are included here not necessarily to give a concrete answer to the whys and hows of building a temple, but they are here enclosed to give a sense of the magnitude of expression, communication and experience behind the Hindu Temple. “Name and Form are in the Residue. The world is in the Residue. Indra and Agni are in the Residue. The Universe is in the Residue. Heaven and Earth, all Existence is in the Residue. Prthivi, the element and goddess Earth (bhu), yields her surface; it is the ground (bhumi) of architecture ritual, as it is the realm of manifestation, and of bodily existence; "it is the place where mortals and immortals reside (vas). The following four are considered as Vastu, residences, by the ancients who were experts in architecture: Bhumi: the ground; Prasada, the temple or palace; Yana, the conveyance, and Sayana: the couch. Bhu the earth is considered the main Vastu, it is the underlying stratum of existence. Those that originate therefrom, the Prasadas and other works of architecture are Vastu (dwelling places, planned sites), because they are Vastu (existing things) and have their support on Vastu (an existing, concretely real thing)" (Mayamata, II. 1-3a). Of these four classes, Bhu, the earth, is described first in the Mayamata, and the other treatises on architecture because "it is the first of the elemental principles (bhuta) and a support for the existence of the world." (ibid. II. 9) (The 5 Bhutas: earth, water, fire, air and ether–are the first or lowermost of the 24 principles (tattva) of the world of duality (atma-tattva)). There will be perfection in the universe as well." Vastu, is primarily the planned site of the building…Vastu here, is the extent of Existence in its ordered state and is beheld in the likeness of the Purusa…Purusa, Cosmic Man, the origin and source of Existence (apara-prakrti), is its instrumental or efficient cause (nimitta-karana) and causes it to be of His substance as its material cause (upadana). This is how He is known in the world, the manifested aspect of Himself, the Para-prakrti, the Beyond-Existence, the Avyaya Purusa, the immutable, Supreme One (Uttama-Purusa). 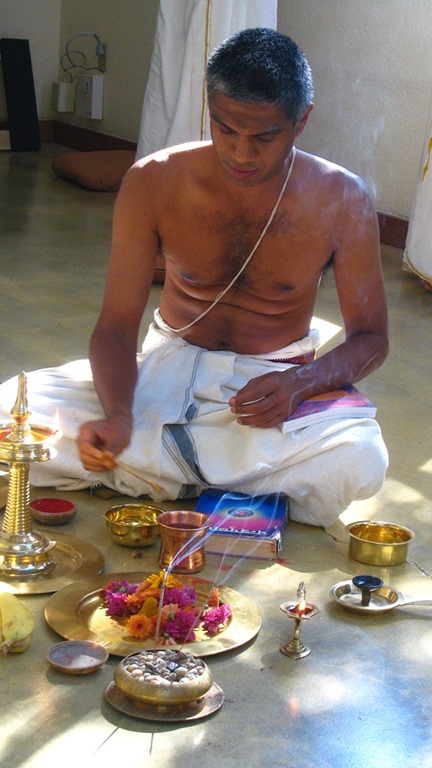 In his identity with the "plan," Purusa is shown in his conditioned aspect. The plan makes the site of the building in his image which is his form. The plan of the building is in the likeness of the Purusa, or of the totality of manifestation. Manifestation comprises all that is seen; it has form, and is measurable; "all that can be measured is in the form of Uma and the measurer is the great Lord." (Lingapurana, LXX. 15). When Purusa thinks of himself, it is in the form of Uma, who shows by her name which is from the root ‘ma’ like Maya, that she is the ‘measured out,’ the manifest world came into existence by the thinking of Purusa. He thinks himself composed of parts while he is the measurer, the great Lord. Ontologically, the act of measuring his form is subsequent and refers back to his undivided presence; it is a reconstitution and similar to it in its purpose is the work of the architects. (Prakrti is Maya and the Great Lord the Mayin, ‘Svetasvatara Upanisad, IV, 10. In the ‘Manasara,’ II. 2-35, it is said that the four progenitors and prototypes of the four divisions of architects are born from the four faces of Visvakarman. They are Visvakarman, Maya, Tvastr, and Manu. 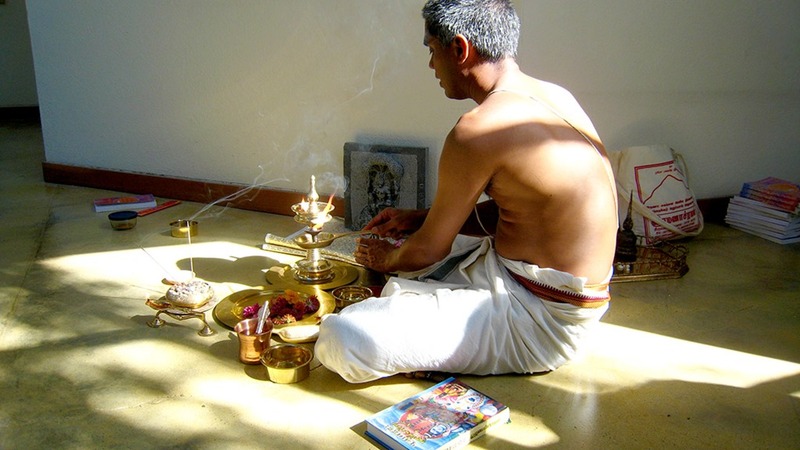 Their descendants are the Sthapati, the master builder; the Sutragrahin or Sutradhara who hold the measuring rod or line, the surveyor or draftsman; the Vardhaki, the builder and painter (from vrdhi, to make grow) and the Taksaka, the carpenter.) It is derived from His activity whose path ‘measures’ the wide heaven (AV. IV. 2.3.). "The Temple is made up of the presence of Siva and Sakti and of the Principles and all forms of manifestation from the elementary substance, Earth, to Sakti. 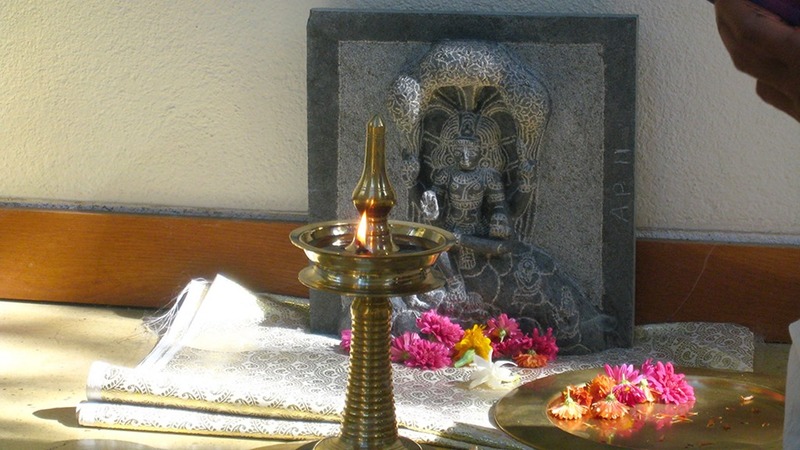 The concrete form of Siva is called House of God. Hence one should contemplate and worship it." 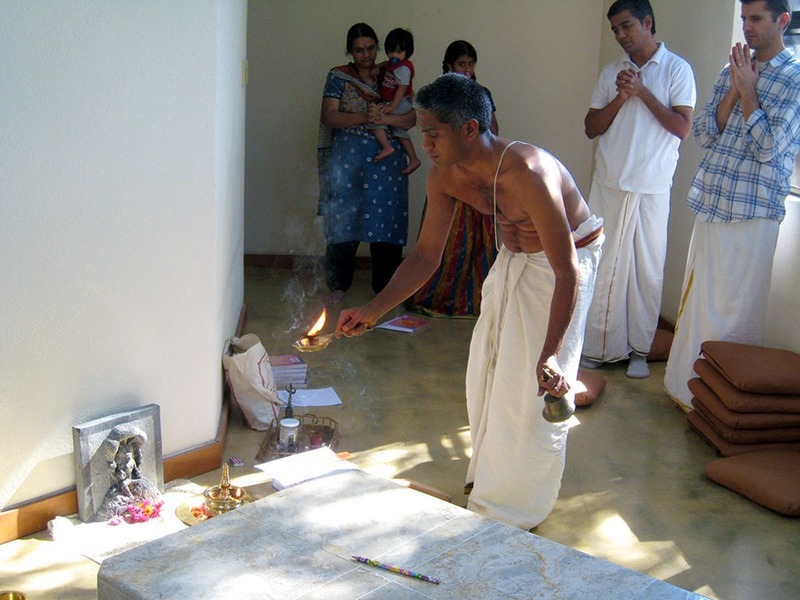 « Sri Sadisvara Mandiram (Part 5) Murtis Arrive!